For a lot of business owners, they’re switching between hats constantly. It’s something they often don’t tell you when you start a business. You’re not only the tradesman, great at his or her craft, but you’re also the receptionist, accountant, marketer, event the janitor. With so much to do, the idea of creating the amount of content needed to be successful in a world where “Content is King” can be daunting. Even for a full-fledged marketing team, sometimes the amount of content that needs to get done can seem like an endless ocean where they forgot their compass somewhere on the mainland. It’s times like these where the only thing that will save you is a killer system. Enter: the content schedule. 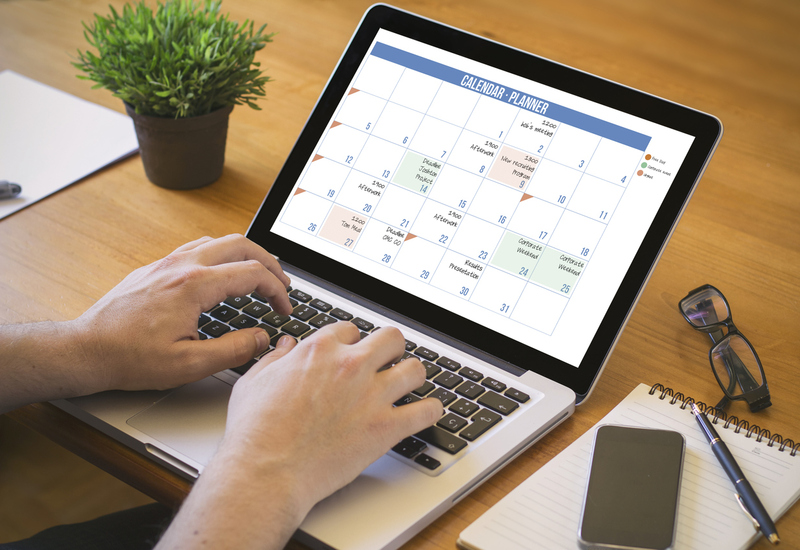 A well put together content schedule turns your workload into a streamlined process that takes minimal effort from you once it’s been crafted. It may seem like trying to swallow an elephant, but we promise it isn’t, and that the work done on the front end will have you feeling ready to do a happy dance when it’s all said and done. Let’s get started. Before you dive in, it’s important to set your parameters. Ask yourself, which types of content will you be posting? Maybe in a fervor, you decide you’ll have an email campaign, some video, weekly infographics about your industry, heck maybe even a podcast! Now hol’ up swoll up. Do you know how to edit video? Do you have the budget for podcast equipment? Do you have the bandwidth it’ll take to design that many infographics? Part of setting yourself up for success is having a realistic outlook from the jump. Pick the kinds of content you know will be useful to your consumers and easy for you to knockout. You’ll also want to decide where you’ll be sharing this content. This step is great for giving a good hard look at what marketing you’re doing for your business. If the only place you have to share this content is your website, it’s time for some honesty. Each piece of content you decide to create can be repurposed and should be shared across a heap of platforms. Think about where your potential clients are likely hanging out. Maybe you need a LinkedIn, or maybe it’s Instagram. Do you have a blog you can send people to? Figure out where you’ll be sharing the types of content you create, and if you’re lacking in outlets, it might be time to create some accounts, friend. Brainstorming your topics upfront will save you a lot of time and sanity in the long run. Keep in mind, each topic should serve your audience in some way. You want to touch on the things they care about, and the best way to do this well is to ask them, straight up. Post some questions to Instagram. Send out a poll in an email campaign if you already have one going. The people will always tell you. Once you’re armed with their answers, it’s time for a massive brain dump. Write down every idea you have, whether you think it’s a knockout or a little weak. Once you’ve written as much as you possibly can, comb through and pick your strongest. PRO TIP: If you really want to go the extra mile, take the topics you’ve come up with and decide how you’ll break them up on each platform. Sometimes you can get 4 or 5 posts out of one content idea. Take this blog for example. We could take each of these section headers, turn them into a graphic, and post each individually to Instagram. From there, we would direct our readers back to this same blog post each time. Now that you've got your basics hammered out, it’s time to pick how you want to organize everything. There is no real right answer for this one, as what works for each person will be different. If you’re working with a team, you’ll all need to use the same method. But as far as what method that is, the options are vast. Some people do better with digital. There are apps and online tools that will let you plug everything you need into place. Maybe your brain works best with an excel spreadsheet. Or maybe you’ve got to see it all written down on paper in your calendar for it to really click. It doesn’t matter, just pick the platform that will personally set you up for the most success. Now that you’ve created your topics, picked your platforms for posting, and selected your recording method, it’s time to plug and chug! Break out the schedule in your chosen tool and share it with your team, or if you’re a one wiz show, put it somewhere you can see it. PRO TIP: To make this even easier, use tools like MailChimp and Hootsuite to craft your actual posts and content and schedule for sharing with your audience down the road. Like we mentioned earlier, systems save, friend. Have more questions about how to create a killer content schedule? We’d love to help! Ask us in the comments below. If not, it’s time to get started! Want to learn how to make your website work for you? Download the Guide Website Marketing Must Haves. Click the button below to get started. Just kidding, but not really! We hope that you find a few nuggets of knowledge to take back to your own marketing. Some of our blogs might be directed at certain industries, but that doesn't mean that you won't find a few helpful tips that will work for you. Don't be scared, dig in! And if you want to stay up to date, be sure to subscribe to our blog.